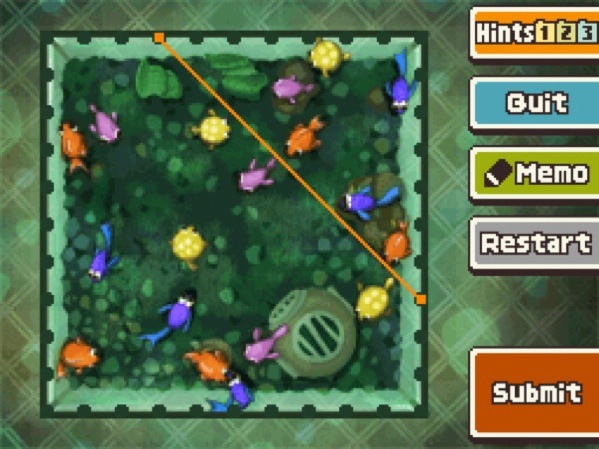 The Professor Layton series is consistent in the extreme; every game has a variation on the same plot, in a similar environment, acting as a vector for puzzles in the same style as previous games. There's definitely a formula. That formulaic nature almost forces me into reviewer cliches. "If you didn't like Professor Layton before," I might say, "there's nothing here to change your mind." "Fans of the puzzle-adventure genre will be well-served here." Even the previous Professor Layton review opened with a note about how similar these games are. But a true gentleman finds a solution to every puzzle put before him, whether it be a tangle of steel cogs or a review of a game that is almost identical to its predecessor. Luckily, I did feel that Professor Layton and the Last Specter improved on its forebears, in both perceptible and imperceptible ways. I like all the other Laytons, but I like this one just a little better. Try this puzzle and then head past the break to read more! As a prequel to the three previous Layton games, Last Specter finds the dapper archaeologist taking his Laytonmobile to the town of Misthallery, where he meets his future assistant Luke for the first time -- and where we meet his pre-Luke assistant, Emmy, for the first time. Though I'm hesitant to talk seriously about the narrative in a game in which the entire world is obsessed with logic puzzles, the characters are likable. Younger Luke is a bit sullen, but clearly brilliant and driven, and Emmy is strong-willed, surprisingly strong physically, and enamored with Layton -- on a purely professional level. They're accompanied by a cast of wacky locals, including a barrel-chested cop who runs to town from London, a young man who always attempts to hide, then exclaims "That's Goosey!" when found, and an elderly candy vendor who rudely refuses candy to anyone but children. As always, the most memorable character is the town, and Misthallery follows the template of Layton towns to the letter. It's the usual assortment of cobblestone streets, tiny houses crammed together and/or stacked on top of each other, and a healthy dose of an intangible "Old World" quality. For me, part of the appeal of Layton games has always been the atmosphere. I just like inhabiting these towns! Misthallery adds a series of canals and the occasional spooky fog. Now how about a puzzle? I'm definitely starting to see a pattern in the puzzles. Across four games, Level-5 and "puzzle master" Akira Tago have developed certain tropes that they continue to return to, like puzzles about shifting objects out of the way to slide a ball from one side to another, or jigsaw-style challenges about moving and rotating objects to fit them in a rectangular space, or capturing board game pieces and leaving only one. These aren't the exact same puzzles as before, but they are new puzzles in the same categories. That's really the one area I wish Level-5 would start making some changes. I'm still entertained by the puzzles, and still challenged much more often than I'd like to admit. They're still great puzzles! I just rolled my eyes a few times when I realized I was going to be doing an overdone style of puzzle again. Now, where the puzzles and the setting are relatively standard Layton fare, Professor Layton's London Life is a massive, 100-hour curveball. Available as a bonus mode from the start, London Life is a completely separate game developed by Brownie Brown, with its own control scheme (no stylus) its own pixelated aesthetic, and its own entirely different gameplay. It's actually a sort of RPG in which you create a character to live in "Little London," interacting with characters who mostly hail from the Laytonverse. London Life is best understood as "Professor Layton's Animal Crossing" with a dash of Sims. Players fulfill "requests" from townspeople in order to build their reputations and earn money, both of which are used to gain access to new jobs, new requests, new clothing, and new items, all of which boost some aspect of the player's reputation further. It's infinitely charming, and completely extraneous from Last Specter. This entire second game was made and included for basically no reason! That addition earns a lot of goodwill with me, as it ensures way more replayability than the usual weekly puzzle downloads. Combined with the expertly crafted ambience of Misthallery (and the accordion-rich soundtrack, which is excellent), and the storyline, which, God help me, I enjoyed, it isn't that difficult to recommend Last Specter. In fact, being a narrative prequel -- and a generally good Layton game, this seems like an ideal starting point. Recommending the game wasn't difficult, but this puzzle was! Good luck. This review is based on a retail copy of Professor Layton and the Last Specter, provided by Nintendo.